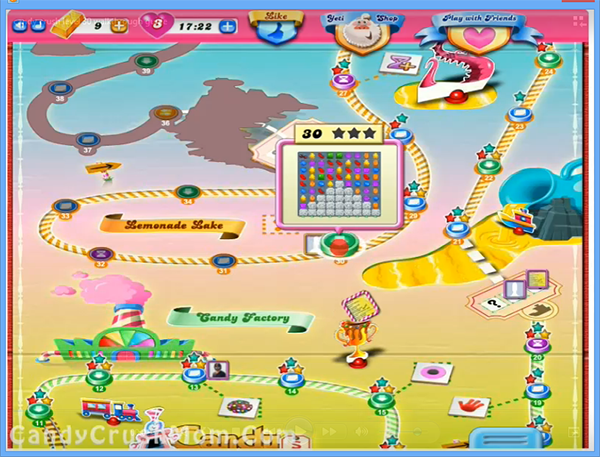 Bring down all ingredients(6) and reach 30000 points complete the level. This level could be little bit easy for you as this level requirement is not that difficult then previous levels and now you used to play this game. If you still can’t reach requirement then you should use few techniques like first try to break candies near to meringue block and as it will break the candy board will start to get bigger and you will get more chances of special candies like striped or wrapped candy. Secondly if you have special candies then leave it for later ingredients and you can use it when you will have less moves and you need to break more candies that will help to bring down cherry and onion ingredients to bottom fast plus will help to reach three star points. We completed this level with 144080 points and luckily take all ingredients to bottom in a second last move plus we got many special candy that helped to reach three start points in end.